The Mitsubishi i-MiEV (MiEV is an acronym for Mitsubishi innovative Electric Vehicle) is a five-door hatchback electric car produced by Mitsubishi Motors, and is the electric version of the Mitsubishi i. Rebadged variants of the i-MiEV are also sold in Europe by PSA Peugeot Citroën (PSA) as the Peugeot iOn and Citroën C-Zero. The i-MiEV is the world's first modern highway-capable mass production electric car. The i-MiEV was launched for fleet customers in Japan in July 2009, and on April 1, 2010, for the wider public. International sales to Asia, Australia and Europe started in 2010, with further markers in 2011 including Central and South America. Fleet and retail customer deliveries in the U.S. and Canada began in December 2011. The American-only version, called "i", is larger than the Japanese version and has several additional features. According to the manufacturer, the i-MiEV all-electric range is 160 kilometres (100 mi) on the Japanese test cycle. The range for the 2012 model year American version is 62 miles (100 km) on the United States Environmental Protection Agency's (US EPA) cycle. In November 2011 the Mitsubishi i ranked first in EPA’s 2012 Annual Fuel Economy Guide, and became the most fuel efficient EPA certified vehicle in the U.S. for all fuels ever, until it was surpassed by the Honda Fit EV in June 2012 and the BMW i3, Chevrolet Spark EV, Volkswagen e-Golf, and Fiat 500e in succeeding years. As of July 2014[update], Japan ranked as the leading market with over 10,000 i-MiEVs sold, followed by Norway with more than 4,900 units, France with over 4,700 units, Germany with more than 2,400 units, all three European countries accounting for the three variants of the i-MiEV family sold in Europe; and the United States with over 1,800 i-MiEVs sold through August 2014. As of early March 2015, and accounting for all variants of the i-MiEV, including the two minicab MiEV versions sold in Japan, global sales totaled over 50,000 units since 2009. Mitsubishi i-MiEV, based on the Mitsubishi i kei car, was first exhibited at the 22nd International Battery, Hybrid and Fuel Cell Electric Vehicle Symposium & Exposition in Yokohama. Mitsubishi eschews the in-wheel motors (MIEV) in favour of a more conventional array of batteries, motor and inverter to replace the "rear midship" engine and fuel tank of the conventional car. Mitsubishi Motors provided three power companies with vehicles in 2006 and 2007 in order to conduct joint research to evaluate how fast-charge infrastructure may be developed for EVs. Fleet testing by five power companies was conducted in 2007. The car had a range of 130 kilometres (80 mi) for the 16 kW⋅h lithium-ion battery pack and 160 kilometres (100 mi) for the 20 kW⋅h pack. Top speed was 130 kilometres per hour (80 mph). Plans were announced in 2008 to sell the i-MiEV in European markets as the Peugeot iOn and Citroën C-Zero. Mitsubishi began supplying the electric cars to PSA Peugeot Citroën (PSA) since 2010, and PSA has a contractual commitment to buy 100,000 i-MiEVs over a period that remained confidential. Mitsubishi i MiEV. Under the rear load platform. The inverter, rectifier and DC-DC voltage reduction device (For auxiliary battery). The motor, differential and reduction gear assembly are beneath. On the left, the red filler cap is for motor coolant (water antifreeze mix). On the right, the electric vacuum pump for the braking system. The vehicle uses a single-speed reduction gear transmission driving the rear wheels and has a 16 kWh lithium-ion battery pack. The car's top speed is 130 kilometres per hour (80 mph). Under its five-cycle testing, the US EPA rated the American 2012 model year Mitsubishi i with a combined fuel economy equivalent of 112 MPGe (2.1 L/100 km), with an equivalent 126 mpg‑US (1.87 L/100 km; 151 mpg‑imp) in city driving and 99 mpg‑US (2.4 L/100 km; 119 mpg‑imp) on highways. This rating allowed the 2012 Mitsubishi i to get a higher MPG-e rating than the 2011 Nissan Leaf, which was rated at 99 MPGe (2.4 L/100 km) combined, but the Leaf rated a better range due to the Mitsubishi i's smaller battery pack. The 16-kilowatt-hour (58 MJ) lithium-ion battery pack consists of 88 cells placed under the base floor. The pack has 22 cell modules connected in series at a nominal voltage of 330 V. There are two 4-cell modules placed vertically at the center of the pack and ten 8-cell modules placed horizontally. Developed by Mitsubishi and GS Yuasa for both high specific energy and high rate discharge and manufactured by Lithium Energy Japan, a joint venture of GS Yuasa Corporation, Mitsubishi Corporation and Mitsubishi Motors Corporation. The entire pack has a specific energy of 80 Wh/kg. The battery has a forced air cooling system to prevent overheating during high charge and discharge rates and consequent damage. There is an integral fan in the battery pack. For rapid charging, the battery pack is additionally cooled with refrigerated air from the car's air conditioning system. In June 2011 Mitsubishi announced the introduction of lithium titanate oxide SCiB battery technology for its two new models of electric vehicles, the i-MiEV and Minicab MiEV. The SCiB technology was developed by Toshiba, which stated that its SCiB batteries can withstand 2.5 times more charge/discharge cycles than a typical lithium-ion battery. In addition, recharging via CHAdeMO takes much less time than charging at the AC Level 2 rate used by most electric vehicle supply equipment (EVSE), allowing the SCiB battery to reach 80% capacity in 15 minutes, 50% in 10 minutes and 25% in 5 minutes. In terms of performance, the SCiB battery offers a higher effective capacity than a typical lithium-ion battery, which combined with more efficient regenerative charging during braking or coasting downhill, allows the SCiB battery to deliver 1.7 times the driving range per charge of a typical lithium-ion battery of the same size. Alternatively, the carmaker could install a smaller battery with less weight and keep the same range to contribute to lower the vehicle price as compared to lithium-ion batteries. Recharging is estimated to take 14 hours from a 110 volt power supply, 7 hours from a 220 volt power supply and as little as 30 minutes from a quick charging station. The SCiB is available in the Japanese model. Other markets have a more typical lithium ion battery. CHAdeMO: On the left hand side of the car, towards the rear, is the “rapid” DC charging point. It is beneath a cover (released from inside the car), there is a dust cover beneath to keep out insects etc. There are two large pins (for the charging current) and eight small ones for control circuitry. The cable used for this purpose is captive to the roadside charging point. When the car is on fast (DC) charge, the air conditioning system is automatically started and refrigerated air is blown through the battery pack for cooling purposes. There is a diverter flap in the ventilation system for this. From depletion, the battery may be charged to 80% full in 30 minutes using this socket. Yazaki: On the right hand side of the car is the “fast” and “slow” AC charging point, accessed in a similar way to the DC charge point. This is a five pin IEC62196 Type 1 point. Three large pins are the line, neutral and earth/ground. The two small pins are a control circuit. This circuit enables the charge current to be cut off when charging is complete, cuts off power if the plug is removed from the vehicle (the plug and socket are both unshuttered), prevents both rapid and fast charging being done simultaneously and also prevents the vehicle from being driven while the plug is inserted. For “fast charging”, the control box (mounted at the roadside) is limited to 20 amps enabling a charge time (from depletion) of four hours. 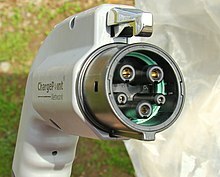 For “slow charging”, a non-captive lead/cord is provided with the car. It is intended for use in the home or other domestic places. This has a local plug at one end and a Yazaki connector at the other. There is an in-line control box in the middle of this lead/cord that functions similarly to the fast charger but limits current to 10 Amps, enabling an eight-hour charge time (from complete depletion on 230 volts). In the aftermath of the 2011 Tōhoku earthquake and tsunami, Mitsubishi introduced one year ahead of schedule a device called MiEV Power Box that enables the i-MiEV to supply power to home electric appliances in the event of a power outage or natural disasters. The device provides 100-volt outlets, converting the i-MiEV's direct current (DC) battery power into 100 volts alternating current (AC) to power up to 1,500 watts of small electrical equipment. Mitsubishi estimates that the i-MiEV total battery capacity is enough to provide power for between 5 and 6 hours, equivalent to one day of power consumed by an average Japanese home. The device was scheduled to be available by the end of April 2012, at a cost of ¥149,800 (US$1,800) but as of November 2013 it is not clear if this is widely available. On the other hand, Mitsubishi HEMS (Home Energy Management System), is the V2G system. The manufacturers have made every effort to make the very different technology of this car appear similar to conventional cars. The lever between the front seats appears to be an automatic transmission control but is not so, though it works in a similar fashion. It is in fact a switch which reverses the electric motor and also offers a degree of control (European cars) over the regeneration. Correct use of the regeneration control can influence the range of the car. As well as "park" "neutral" and "reverse" there are three regeneration positions, intended for city driving, hilly terrain, and flat terrain respectively. Used correctly, on most journeys, a large percentage of kinetic energy and potential energy can be returned to the battery. Lifting off the accelerator/”gas” pedal also induces regeneration as does light pressure on the foot brake. The only other mechanical losses are frictional. The main loss is aerodynamic drag which is proportional to the square of speed, hence high speeds are inefficient and reduce range. Regeneration and power consumption can be monitored by the driver with an analogue instrument on the dashboard/control panel which shows both instantaneous power consumed and regeneration. The heating of the passenger cab is by a conventional "wet" automotive system. Heat is derived from the traction battery via a resistance element. Use of the heater significantly reduces range. The traction motor cooling system runs at much lower temperatures than in a conventional car and is therefore separate from the cab heating system. While the car is charging, the interior can be preheated to alleviate the range reduction problem. The car is fitted with air conditioning. The compressor is located beneath the HVAC controls in the car and has its own electric motor driven from the traction battery via a dedicated inverter. The condenser is mounted in front of the traction cooling radiator at the front of the car. The evaporator is inside the HVAC control. Use of the air conditioning system can significantly reduce range. To alleviate this, the car can be set to "precool" whilst on charge. A remote control/timer device is provided that controls the preheat function, air conditioning and also controls and monitors battery charging. There is an auxiliary, 12volt conventional lead acid battery under the bonnet/hood for the accessories. It is also needed to control and charge the main traction battery and to start the vehicle. It is charged from the main traction battery via a DC-DC voltage reduction device. If it is discharged, the vehicle cannot be started, neither can the main traction battery be charged. Use of 12 volt "jump cables" from another vehicles is possible. The steering is rack and pinion with electric power assistance. An emergency cutoff for main battery is located under the front left hand seat. If the car is involved in a collision, there is a cutoff switch that is operated by the "G" forces involved. The front and rear wheels are different sizes. Instead of a spare wheel, a roadside repair kit with a 12 volt electric compressor (plugs into cigarette lighter) and a bottle of repair fluid is located under the cushion of the rear passenger seat. The braking system is conventional hydraulic (Power assisted) with disk brakes at the front and drum brakes at the rear. Anti-lock Braking System and Traction Control System is fitted. The hand/parking brake is cable operated, acting on the rear wheels. The hydraulic fluid reservoir is under the front bonnet/hood. As there is no manifold vacuum, there is an electric vacuum pump located under the rear loading platform. On some models, there are interlocks on the braking system so that the startup process can only be initiated when the brake pedal is pressed. The all-electric range is 100 miles (160 km) on the Japanese test cycle. Two additional trim levels will be available in Japan beginning in late July 2011, the entry-level “M” with a 10.5 kWh battery pack has a reduced range of 120 kilometres (75 mi), and the higher-level "G" with the same a 16.0 kWh battery as the original i-MiEV has a range of 180 kilometres (110 mi). The "G" trim availability was announced as mid August 2011. The US EPA official range for the 2012 model year American "i" version is 100 kilometres (62 mi) based on the five-cycle tests using varying driving conditions and climate controls. Under the LA4 driving cycle for city conditions, EPA's rated range is 98 miles (158 km). According to the carmaker, the city range of the 2012 Mitsubishi i was improved as compared to the previous i-MiEV versions, through software upgrades and a revamped regenerative braking system. The Australian Government's Green Vehicle Guide estimated the i-MiEV's range to be 155 kilometres (96 mi). In practice range is affected by driving style, hilliness of the terrain, speed and use of passenger compartment heating and cooling. Strong head and following winds also make a noticeable difference. The drive system is permanently connected to the rear wheels. This means that if there is mechanical damage to the power train the vehicle must be transported/towed with the rear (driving) wheels off the ground to prevent further damage. For other problems so long as power is available for the braking and steering system, the vehicle can be conventionally towed subject to instructions in the owner's manual. Using the car to tow trailers is not recommended. Euro NCAP also states that it "believes that the star rating of the i-MiEV can also be applied to the Citroën C-Zero" because the agency was informed that the Citroën C-Zero is structurally identical to the Mitsubishi i-MiEV and has the same interior fitting and levels of safety equipment. The Australasian New Car Assessment Program (ANCAP) rated the i-MiEV four out of five stars for crash safety, scoring 28.35 out of 37. This score takes into account a 10.95 out of 16 rating in the frontal offset crash test, and a score of 14.4 out of 16 received for the side impact test. The U.S. National Highway Traffic Safety Administration (NHTSA) gave the 2012 model year i-Miev a four out of five-star crash rating. In March 2013 Mitsubishi Motors reported two separate incidents with lithium-ion batteries used in its plug-in electric cars, one with an i-MiEV and the other with an Outlander PHEV whose battery pack overheated and melted some of the battery cells. The battery packs are produced by GS Yuasa, the same company that supplies the batteries for the Boeing 787 Dreamliner, whose entire fleet was grounded in January 2013 for lithium-ion battery problems. The lithium-ion battery of an i-MiEV caught fire at the Mizushima battery pack assembly plant on March 18 while connected to charge-discharge test equipment. Mitsubishi did not issue a recall, but halted production and sales of the two models until it determined the causes of the battery problems. According to Mitsubishi's statements at the time, the problem with the i-MiEV battery pack was related to a change in the GS Yuasa manufacturing process, and the carmaker notified fleet-vehicle operators with i-MiEVs whose batteries were made under the same process as those that overheated, and was working on a possible fix. Full production of the i-MiEV started in July 2009 and Mitsubishi expected initial sales volume to be small, to sell up to 1,400 vehicles by March 2010, but expected sales to rise to 5,000 vehicles in the following twelve months, once retail sales had started. Mitsubishi decided to target sales to corporate customers in Japan at first to allow local governments and businesses to set up recharging stations around the country. The company said initial sales were constrained by production capacity but expects production to ramp up quickly from 2,000 units in 2009/10 to 30,000 vehicles within three years as it expands production of lithium-ion battery through Lithium Energy Japan, a joint venture with GS Yuasa Corporation and Mitsubishi Corporation. Production was projected to increase to 9,000 units in its fiscal year 2010/11, and to 18,000 in the following twelve months. Production of the left-hand drive European-spec i-MiEV began in October 2010. By the end of November 2010 cumulative production had reached 5,000 units at Mitsubitshi's Mizushima Plant. In May 2011 Mitsubishi announced a new production target of 25,000 i-MiEVs worldwide in fiscal year 2011. The carmaker also plans to export about 15,000 units overseas, mainly to Europe, where the company will promote sales to the European public sector, such as police departments and local governments. Production of the American-spec i electric car began in late October 2011. Since July 2009 Mitsubishi had manufactured more than 33,000 i-MiEVs and rebadge versions by March 2013, including more than 11,000 units rebadged in France as Peugeot iOn and Citroën C-Zero, and sold in the European market. In August 2012, and as a result of Europe's debt crisis that resulted in PSA Peugeot Citroën (PSA) Group slow sales, Mitsubishi Motors announced the suspension of its supply of the i-MiEV electric vehicle to PSA, although the period for supplying vehicles under their contract as part of original equipment manufacturer agreements has not yet ended. The suspension is part of the decision of several Japanese manufacturers to suspend their joint development projects and contracts with several European partners. By early August 2012, PSA had sold a total of 6,575 Peugeot iOns and Citroën C-Zeros since their launch in Europe in 2010, while Mitsubishi had assembled almost 11,000 electric cars destined to PSA, leaving the French carmaker with more than 4,400 electric cars in unsold inventory. PSA only sold 50% of the sales target set for 2011 and according to PSA the supply was only temporarily interrupted. In May 2014, PSA Peugeot Citroën Chief Executive, Carlos Tavares, announced that the carmaker will decide over the next 12 months whether to continue selling electric vehicles manufactured by its partner Mitsubishi. Sales of both of PSA rebadged electric cars fell significantly from 2012 to 2013 as a result of new competition from Nissan, Renault and BMW. 2010 425 425 7,646 C-ZERO and iOn launched. 2011 3,377 3,257 8,161 3,607 total Peugeot iOns produced. 3,724 total Citroën C-ZEROs produced. 2012 1,800 1,800 TBA 5,400 total Peugeot iOns produced. 5,500 total Citroën C-ZEROs produced. The i-MiEV was launched for fleet customers in Japan in July 2009, becoming the world's first modern highway-capable mass production electric car. Sales to retail customers began in Japan in April 2010. The Mitsubishi i MiEV was the first electric car to sell more than 10,000 units, including the models badged in Europe as Citroën C-Zero and Peugeot iOn. The record, officially registered by Guinness World Records, was reached in February 2011. Several months later, the Nissan Leaf overtook the i MiEV as the best selling all-electric car. Accounting for all vehicles of the iMiEV brand, Mitsubishi reported around 27,200 units sold or exported since 2009 through December 2012, including the minicab MiEVs sold in Japan, and the units rebadged and sold as Peugeot iOn and Citroën C-Zero in the European market. As of June 2016[update], about 37,600 i-MiEV family passenger cars have been sold worldwide since 2009, including the rebadged Peugeot iOn and Citroën C-Zero sold in Europe. As of July 2014[update], Japan was the top selling country market with 10,011 i-MiEVs sold. All three variants of the i-MiEV family have sold over 17,500 units in Europe as of July 2014[update] , with registrations led by Norway with 4,920 units registered, followed by France with 4,710 units, and Germany with 2,419 units. The fifth largest country market is the United States, with 1,831 i-MiEVs sold through August 2014. As of early March 2015, and accounting for all variants of the i-MiEV, including the two minicab versions sold in Japan, over 50,000 units have been sold worldwide since 2009. Two i MiEVs in Sydney, Australia, being leased by Better Place and Coulomb Technologies. In March 2009 the i-MiEV was exhibited in Australia at the Melbourne International Motor Show, and afterwards was toured throughout the country. Beginning in mid 2009, Mitsubishi conducted a twelve-month field trial with potential electric vehicle customers, such as local, state and federal government bodies, and major fleet operators. Sales for fleet customers began in Australia in August 2010 under leasing agreement at a price of A$1,740 a month for 36 months, for a cumulative total of A$62,640 after which the car has to be returned to the dealer. The initial shipment included only 40 units, but Mitsubishi Motors Australia reported that just before the launch it had received applications for more than 100 vehicles from private companies and government departments. The initial batch of vehicles leased to government and corporate fleets totals 112 vehicles. Retail sales to the public began in August 2011. Currently, there are no government incentive or rebate schemes for purchasing fuel-efficient vehicles in the country. The new Australian i-MiEV version is similar to the European-spec model released in 2011, with minor changes such as new three-spoke alloy wheels, a few minor exterior tweaks including dark tinted headlights and a revised front bumper with fog lights. With an Australian Design Rules approved range of 155 km (96 mi), the Australian-spec i-MiEV is sold for A$48,800 (US$51,444 as of July 2011) through specially equipped Mitsubishi dealerships (one in each capital city and two in Sydney). Mitsubishi anticipates 5 sales to the public per month. Since then a large number of dealerships across Australia have purchased scoops of these vehicles and most dealerships (mainly in Victoria) have a single i-Miev in their showrooms at prices never seen in this market before. During 2011 a total of 30 i MiEVs were sold, and cumulative sales reached 252 units through December 2013. As of March 2014[update], Mitsubishi is no longer selling the i-MiEV due to slow sales. In January 2009, Hydro-Québec and Mitsubishi signed an agreement to test 50 i-MiEVs, the largest pilot test of electric cars in Canada ever. The test's goal was to allow a better understanding of winter usage of the technology. BC-Hydro and Mitsubishi had previously tested a three-vehicle fleet in British Columbia. The first five i-MiEVs were delivered in December 2010 and were assigned to staff from the city of Boucherville. In October 2010, Transport Canada and Mitsubishi Motor Sales of Canada announced a partnership to test the Mitsubishi i-MiEV. Transport Canada’s ecoTECHNOLOGY for Vehicles (eTV) Program tested two i-MiEVs in government facilities and in a variety of real-world conditions. This program aim was to evaluate the i-MiEV road performance and range. Retail sales of the i-MiEV began in December 2011 at a starting price of CA$32,998 (US$33,891) before any government incentives available in Ontario and Quebec. Cumulative sales through December 2014 reached 496 units. Mitsubishi sold the US i-MiEV version in Canada, although the international version was used in test fleets, and two trims were offered, standard and premium. The premium package price was CA$35,998 (US$36,972) and included leather-wrapped steering wheel and shift knob, 15-inch alloy wheels, premium audio system, HDD Navigation system, Bluetooth 2.0 hands-free cellular phone interface with streaming audio and USB input with voice control. For the 2018 model year, Mitsubishi made the decision to cease i-MiEV sales in Canada. The Citroën C-Zero is a rebadged Mitsubishi i-MiEV. The European version of the i-MiEV was introduced at the 2010 Paris Motor Show. Specific features of the European version include a new design to the front and rear bumpers to meet EU regulations, re-arranged center stack in the instrument panel, improved interior comfort and both active and passive safety features have been improved with the addition of Active Stability Control (ASC), as well as side and curtain airbags, all included as standard equipment. The European MiEV achieves an all-electric range of 150 kilometres (93 mi) under the European NEDC driving pattern. Mass production of the European i-MiEV began in October 2010 at Mitsubishi's Mizushima plant, along with production of its siblings by PSA Peugeot Citroën, the Peugeot iOn and the Citroën C-Zero. In January 2011, Mitsubishi shipped 2,500 i-MiEVs from Japan and began sales in 15 countries: Austria, Belgium, Denmark, France, Germany, Ireland, Italy, the Netherlands, Norway, Poland, Portugal, Spain, Sweden, Switzerland, and the United Kingdom, and further expand the European roll out through 2011. Mitsubishi also run demonstration programs with the i-MiEV in the Principality of Monaco, Iceland, and Denmark. The price of the European version vary by country was set to around €33,000 to €35,000 (US$41,900 to US$44,400). The carmaker aimed for a final cost to the customer of under €30,000 (US$38,000) or equivalent after government incentives. Retail deliveries began in 2011. A total of 704 units have been registered in Austria through December 2013, including 332 C-Zeros, 254 i MiEVs, and 118 iOns. Deliveries began in 2011. A total of 550 units have been registered in Denmark through December 2013, including 227 iOns, 202 C-Zeros, and 121 i MiEVs. On March 3, 2011, the government of Estonia confirmed the sale to Mitsubishi Corporation of 10 million carbon dioxide credits in exchange for 507 i-MiEV electric cars. The deal also includes funding to build 250 express charging stations in larger towns and main highways by 2013, and will subsidize the first 500 private buyers of any electric car approved by the European Union. The first 50 i-MiEVs were delivered in October 2011 and this official fleet will be assigned for use by municipal social workers. During the first round of allocations of the electric cars, municipalities requested only 336 of the 507 i-MiEVs available. Several local authorities have stated concerns about the i-MiEV's performance during harsh winter conditions, maintenance costs, and reliability on difficult countryside roads. A Peugeot iOn charging in Nice, France. The i-MiEV family sold 1,326 units in 2011, representing a market share of 50.4% of electric car sales in France. Sales were led by the Citroën C-Zero with 645 units followed by the Peugeot iOns with 639 vehicles, and the i-MiEVs with 42 units sold in 2011. In 2011 PSA Peugeot Citroën was awarded a contract to supply 3,900 electric cars to the French Government, to be used by government officials in Paris. Since its introduction in 2010, the i-MiEV family has sold 4,772 units through December 2014, including 2,419 iOns, 2,241 C-Zeros, and 112 i-MiEVs. The C-Zero is available for rental starting at €35 (US$51) for half a day. The electric car is rented by the MultiCity vehicle rental service in selected French cities. The C-Zero is available in the Paris region at six locations: the Gare Montparnasse, Gare de Lyon and Gare du Nord train stations, Paris-Orly Airport, Porte Maillot and Nanterre. The i-MiEV was launched in Germany in December 2010 at a price of €34,990 (~US$51,000). Germany does not have government purchase subsidies. The only incentive available is an exemption from the annual circulation tax for a period of five years from the date of first registration. On August 30, 2012, approximately 100 Citroën C-Zeros were deployed in Berlin as part of the Multicity Carsharing program. The number of cars is expected to grow to 500 by year end. Sales of the i-MiEV family represented 50.6% of all electric car sales in the country in 2011. Combined sales of the three variants peaked in 2011, with 1,146 units registered, and then fell to 788 units in 2012 and 413 in 2013. As of December 2014[update], a total of 2,494 units have been sold consisting of 976 i-MiEVs, 965 C-Zeros, and 553 iOns. Retail deliveries began in February 2011. Cumulative sales totaled 540 units through December 2013 including 295 C-Zeros, 189 iOns and 56 i-MiEVs. Sales started in 2011. In January 2019, the importer announced the i-MiEV will be discontinued. A total of 154 i-MiEVs have been sold, as well as 228 C-Zeros and 325 Ions, making up a combined total of 707 units. Both the Peugeot as the Citroën will still be available. Since deliveries began in January 2011, the i-MiEV became the best selling electric car in the country, and the 1000th i-MiEV was delivered in November 2011. A total of 2,240 electric cars were sold in Norway during 2011, of which, 1,050 were i-MiEVS, 210 were Citroën C-Zeros, and 217 Peugeot iOns, for combined sales of 1,477 units representing together a 66% share of all electric cars sold during the year. Registrations climbed to 1,670 units in 2012, then fell to 1,094 in 2013, and stabilized in 2014 with 1,093 units. Cumulative registrations through December 2014 reached 5,334 units, including 2,589 i-MiEVs, 1,352 C-Zeros, and 1,393 iOns. A Peugeot iOn in Bilbao, Spain, operating for the IBILEK car sharing service. Retail sales began in December 2010 and the i-MiEV price starts at €29,153 before sales tax or any government incentives. A total of 233 i-MiEV family electric cars were sold during 2011, representing 58% of all electric vehicles sold in Spain that year. Cumulative sales through December 2013 reached 546 units including 204 iOns, 196 i-MiEVs and 146 C-Zeros. Since their inception a total of 196 units have been registered in Sweden through December 2013, including 92 i MiEVs, 67 C-Zeros, and 37 iOns. Deliveries began in 2011. Cumulative registrations totaled 615 units through December 2013, including 342 i-MiEVs, 155 C-Zeros and 118 iOns. In December 2009 Mitsubishi began an electric vehicle trial in the UK with a fleet of 25 i-MiEVs. The i-MiEV demonstration is part of the project Coventry and Birmingham Low Emission Vehicle Demonstrators (CABLED), which ran in the English Midlands with a variety of vehicles including plug-in hybrids and the extended range electric Jaguar XJ. In March 2010, the company reported that after the first three-month period the trial fleet ran an average of 23 miles (37 km) a day, have been parked 97% of the time, and most of the individual trips were under 5 miles (8 km). Another key finding in the test report is that the vehicles were driven in temperatures as low as −10 °C (14 °F) during the winter period, and it was observed a drop-off in usage during extremely cold weather, when only essential journeys are made. In March 2010, Mitsubishi announced that the i-MiEV would be sold at a price of GB£38,699 (~US$55,870), but in August 2010 the company reduced the price to GB£28,990 (~US$45,100). Sales to the public in the UK began in January 2011, which coincided with the date the GB£5,000 Plug-in Car Grant came into effect. Mitsubishi authorized 13 sales centres with two in London and the rest spread across England, Scotland and Northern Ireland. In April 2011 Hertz Rent-a-Car added two i-MiEVs to its fleet of vehicles in London and intends to add more across the UK later in 2011. The i-MiEVs are offered as rental vehicles to Hertz on Demand members and these electric cars will be supported by 16 Hertz-installed quick-charge stations located in and around London. A total of 862 units have been registered in the UK through June 2013, including 401 iOns, 260 i MiEVs, and 201 C-Zeros. In June 2016, reports surfaced that the i-Miev was no longer being sold in the UK, and no more new vehicles would be available. Mitsubishi have not supported UK cars with the same 10 year traction battery warranty provided in other markets. Mitsubishi i-MiEV recharging from an on-street charging station in Japan. The i-MiEV was launched for fleet customers in Japan in late July 2009, after Mitsubishi's more than 40 years in development of electric vehicles. Initial price was set at ¥4,590,000 (US$46,500). The Japanese government is offering subsidies of up to ¥1,390,000, and some local governments are also offering additional subsidies that could bring the price down to as low as ¥2,200,000. Mitsubishi reduced the price of the vehicle by ¥619,000 (US$6,700) to just below ¥4,000,000 two days before it went for retail sales in Japan in April 2010 to compete with the Nissan Leaf. As of early 2010 there were 60 charging stations in Japan. In June 2010 Mitsubishi Motors announced that is aiming to cut the price of its electric vehicles to ¥2 million(US$21,890) by fiscal year 2012 to obtain price parity in the showrooms with hybrid electric vehicles. Mitsubishi is expecting that mass production of lithium ion batteries from its battery plant coming online in April 2012 will allow to reduced battery cost from its current ¥2.5 million to less than ¥1 million. In March 2010, the company said it had received about 2,000 advance orders in Japan for the vehicle. Cumulative sales reached 3,000 units in Japan by October 2010. Sales in the Japanese market raised from 986 in 2009 to 2,340 in 2010, and then stabilized at 2,290 units in 2011 and 2,295 in 2012. Sales fell to 1,491 units during 2013, and to 1,021 units during 2014. As of December 2014[update], cumulative sales reached 10,423 i-MiEVs since July 2009. Two new trims levels were launched in the Japanese market in the second half of 2011. Beginning in July 25, the lower-level "M" trim will be sold for ¥1,880,000 (US$23,200) after the government subsidy. The "M" trim has a 10.5 kWh battery and its equipment and trim specification were adjusted to allow a more accessible price. The "M" trim range is 120 km (75 mi) on the JC08-cycle. The higher-level "G" trim will be available by mid-August at a price varying from ¥2,600,000 (US$32,100) to ¥3,800,000 (US$47,000). The "G" trim has the same 16.0 kWh battery as the original i-MiEV, but the new trim realizes around a 20% increase in its single charge range on the J08-cycle, offering 180 km (110 mi). The "G" has LED headlamps and rear combination lamps, 15-inch alloy road wheels, leather-wrapped steering wheel and shifter knob and other high-grade equipment, such as a navigation system and heated seats for the driver and front passenger as standard. The first fleet and individual customer deliveries in the U.S. took place in December 2011. Mitsubishi initially announced a base price of US$27,990, but in September 2011 raised the base price to US$29,125 plus the destination charge and prior to the federal tax credit and other incentives available in California and other states. The American version of the Mitsubishi i-MiEV was unveiled at the November 2010 Los Angeles Auto Show. During the LA show, Mitsubishi announced it decided to drop the "MiEV" from the name and the US version will be named simply as "i" electric vehicle. i-MiEV test drive event in Washington, D.C. The U.S.-only version is enlarged, has redesigned front and rear bumpers, and includes more features than the Japanese and European versions in order to meet crash standards, government mandates, and the preferences of the U.S. consumers. The American version is 285 millimetres (11.2 in) longer than the Japanese version, 110 millimetres (4.3 in) wider, and slightly taller. It also has advanced airbags and the mandated tire-pressure monitoring system (TPMS), has an upgraded interior and features more accessories. The entry-level ES trim starts at US$29,125, the SE trim is at US$31,125, and the SE Premium version is priced at US$33,915 including an HDD navigation system and better entertainment and audio options. These prices do not include an US$850 destination charge. For either of the models, available options include a factory-installed CHAdeMO fast-charging port for US$750 and the Cold Zone package, which includes a battery warming system and heated outside mirrors for US$150. The reservation process for the U.S. began on April 22, 2011, and customers were required to pay two deposits: US$299 for the car and US$99.99 for a required home inspection. The carmaker decided to waive the US$100 fee for the first 2,000 people who placed an order and then buy the car. Mitsubishi is only accepting PayPal as the method of payment for these online transactions. Mitsubishi began sending order confirmation emails and offering optional accessories by early September 2011. In November 2010, Mitsubishi announced partnerships with Eaton and Best Buy for sales and home installation of recharging units. Initial availability is limited and the initial roll-out markets include California, Hawaii, Oregon, and Washington, followed by the Northeastern states. Nationwide availability is expected by mid 2012. The first delivery to a fleet customer took place on December 8, 2011 in San Francisco. The first delivery went to City CarShare, a non-profit carsharing service that operates in San Francisco, Oakland, and Berkeley. The first individual customer delivery took place on Honolulu, Hawaii, on December 12, 2011. Sales increased from 80 units in 2011 to 588 in 2012, and rose to 1,029 during 2013. Sales fell to only 196 in 2014. A total of 1,893 i cars have been sold in the U.S. through December 2014. Changes to 2014 model year vehicle include driver and front passenger heated seats, CHAdeMO DC quick charge port, battery warming system, heated side view mirrors, rear door speakers, 8A/12A switchable Level 1 charging cable (approximate charge time from near empty to fully charged - 22 hours for 8 amp/14 hours for 12 amp), charge port lamp, leather-covered steering wheel and shift knob, passenger-side vanity mirror with lid, numerous decorative color/trim upgrades, aluminum wheels, front fog lights, new daytime running lights (DRL), black-out door sash trim, US $6,130 lower price before incentives. In August 2017, a Mitsubishi representative confirmed that the i-Miev has been discontinued in the United States. No further imports of the vehicle are planned into this country. The i-Miev had sold poorly in the United States from its introduction. Notes (1): Exchange rates as of December 31, 2011. The i-MiEV was launched in May 2011 at a price of CLP27,7 million (US$60,000). Initial availability is limited to 25 units. The first public quick charging station in the country was opened in April 2011 in preparation for the arrival of the first i-MiEV electric cars. As of August 2012[update], only 10 units have been sold. As of 2015[update] the dealer is no longer selling the i-MiEV, it has been replaced by the Outlander plug-in hybrid. The i-MiEV was launched in February 2011 at a price of US$61,500. Costa Rica does not have any government incentives for electric cars. According to Mitsubishi, Costa Rica was selected at the first market launch in the Americas due to its environmental record. Initial availability will be limited to 25 to 50 units. Sales are oriented to supply mainly fleet customers including government agencies and electric companies. In December 2009, the Hong Kong Government and other corporation began testing the i-MiEV, totaling 30 vehicles tested until May 2010. Sales to the public in Hong Kong began in May 2010 at a price of HK$395,000 (~US$50,631). The i-MiEV was released in Malaysia in March 2013 at a price starting at RM136,118 (approx US$43,995), becoming the first electric car sold in the country. Mitsubishi expects to sell more than 50 units during its first year in the market. The Penang Second Bridge highway patrol unit, JKSB Ronda using i-MIEV for patrolling and to provide assistance to commuters on the bridge. Seven charging stations were also set up at the toll plaza on the mainland, two of them being rapid chargers which are able to give an 80 per cent charge in 30 minutes. Between January and March 2009 the i-MiEV was brought to New Zealand as part of an electric vehicle trial, during which the i-MiEV travelled the entire country, testing infrastructure and demonstrating the vehicle to the public. As of March 2011 there were 8 i-MiEV in use in Wellington, as a field trial sponsored by the Wellington City Council, New Zealand Post, Meridian Energy, The Wellington Company and Mitsubishi Motors. Sales to the public are scheduled for July 2011 at a price of NZ$59,990 (~US$51,325), and the number of units will be limited. The i-MiEV was launched in June 2011 at a price of ₽1,799,000 (~US$64,946). The price would be sat at ₽999,000 (~US$28,948) on 1 February 2014. There were 211 cars sold in 2013, many of them bought by government organizations. As of 2013-2014 i-MieV is the only electric car sold in Russia. In November 2010 Mitsubishi signed an agreement with the Singaporean government to introduce electric vehicles in the country. Mitsubishi will supply 25 i-MiEVs in 2011 to the Economic Development Board, the Energy Market Authority and the Land Transport Authority, which are part of a multi-agency EV task force. This agreement is part of a three-year US$20 million test program that will deploy charging infrastructure for electric vehicles and evaluate the cost benefits of EVs for future adoption. The delivery of the first batch of 10 i-MiEV electric cars is scheduled for May 2011. In December 2010, Mitsubishi Motors and the government of Thailand agreed to start fleet testing electric vehicles for a possible launch of i-MiEV. In July 2011, a new agreement was signed to begin the trials with the participation of the Metropolitan Electricity Authority (MEA) and PEA ENCOM International (PEA), two of Thailand's electricity distribution companies. A test fleet of 10 i-MiEVs was deployed in Masdar City in Abu Dhabi in 2011 as part of a one-year pilot to test a point-to-point transportation solution for the city as complement of its sustainable public transportation systems, the Personal Rapid Transit (PRT) and the Freight Rapid Transit (FRT), both of which consist of automated electric-powered vehicles. As of the end of February 2018 a total of 46,827 i-MiEV family passenger cars have been sold worldwide since 2009, including the rebadged Peugeot iOn and Citroën C-Zero sold in Europe. The following table presents total retail sales by year since deliveries of the i-MiEV began in July 2009 for the top selling national markets by variant (Mitsubishi i-MiEV/i, Peugeot iOn and Citroën C-Zero) through June 2014. Notes: (1) CYTD: current year-to-date sales through June 2014. (2) No longer available in Australia due to low sales. "2009 Japan Automotive Hall of Fame Car Technology of the Year" award in October 2009. "Japanese Car of the Year Most Advanced Technology" awarded during the 41st Tokyo Motor Show in October 2009. "Ecobest 2009" by AUTOBEST in January 2010. "Environment Special Grand Prize" awarded during the 25th International Automobile Festival, Paris, France in February 2010. The i-MiEV was one of the five finalists to the 2011 Green Car Vision Award. The 2012 model year American-spec i-MiEV was one of the five finalists for the 2012 Green Car of the Year. The American-spec i-MiEV was rated first in the "2012 Greenest Vehicles of the Year" list elaborated by the American Council for an Energy-Efficient Economy. The 2012 model year American-spec i-MiEV ranked first in United States Environmental Protection Agency’s (EPA) 2012 Annual Fuel Economy Guide, and between November 2011 and June 2012 ranked as the most efficient EPA certified vehicle in the U.S. for all fuels ever, until it was surpassed by the Honda Fit EV. ^ "Our Journey Toward Public EV Quick-Charging Begins". Autopia. 2010-05-26. Retrieved 2010-06-02. ^ "2012 i-MiEV Specifications". Canada: Mitsubishi. Archived from the original on 2012-01-22. Retrieved 2013-08-08. ^ a b c d "Mitsubishi Motors' North American Version Of i-MiEV To Make World Premiere At The Los Angeles Auto Show". Mitsubishi Motors (Press release). 2010-11-08. ^ a b Yuri Kageyama (2010-04-01). "Japanese Start Buying Affordable Electric Cars". ABC News. Associated Press. Retrieved 2011-01-12. ^ a b Nikki Gordon-Bloomfield (2014-10-15). "Mitsubishi Recalls 2009-2014 i-Miev Electric Cars for Faulty Brake Vacuum Pump". Transport Evolved. Retrieved 2015-02-16. ^ a b c d Bill Moore (2015-03-19). "Mitsubishi Firsts". EV World. Retrieved 2015-03-19. ^ a b c d e f Chang-Ran Kim (2010-03-30). "Mitsubishi Motors lowers price of electric i-MiEV". Reuters. Retrieved 2010-04-25. ^ a b c d Chris Woodyard (2011-12-08). "Mitsubishi delivers its first 'i' electric car". USA Today. Retrieved 2011-12-10. ^ a b c Mitsubishi Motors North America (2011-12-12). "Mitsubishi Motors, Governor of Hawaii and Cutter Mitsubishi Hand Over Keys to First 2012 Mitsubishi i-MiEV Retail Customer". ABC Action News. Retrieved 2011-12-12. ^ a b c d Sebastian Blanco (2011-04-21). "New York 2011: Mitsubishi sets price of all-electric i at $27,990 (must use PayPal for deposit) *UPDATE". AutoblogGreen. Retrieved 2011-04-21. ^ a b Ian Palmer (2012-03-14). "2012 Mitsubishi i-MiEV gains traction in Canada". CarPages.ca. Archived from the original on 2013-10-13. Retrieved 2012-03-20. ^ a b Nikki Gordon-Bloomfield (2011-11-18). "2012 Mitsubishi i Ranked By EPA As Most Efficient Electric Car On Sale". Electric Car Report. Retrieved 2011-11-21. ^ a b Sebastian Blanco (2012-06-06). "Honda Fit EV rated at 118 MPGe with 82-mile range by EPA *UPDATE". Autoblog Green. Retrieved 2012-12-15. ^ "Mitsubishi Motors builds new research EV, "i-MiEV" for joint research with power companies". Mitsubishi Motors Press Release. 2006-10-11. Retrieved 2010-09-27. ^ Leblanc, Yohann (December 9, 2008). "Des françaises électriques à l'accent japonais" (in French). L'automobile. Archived from the original on December 15, 2008. ^ a b c Ingrid François (2012-08-10). "PSA suspend ses achats de voitures électriques auprès de Mitsubishi" [PSA suspends purchases of electric cars from Mitsubishi]. Les Échos (France) (in French). Retrieved 2012-08-07. ^ Graeme Roberts (2012-08-08). "Mitsubishi confirms 'temporary' halt to PSA-branded i-MiEVs". Just-Auto. Retrieved 2012-08-12. ^ "Mitsubishi Motors to bring new-generation EV i-MiEV to market" (Press release). Mitsubishi Motor. 2009-06-05. Retrieved 12 May 2018. ^ "About i MiEV". Mitsubishi Motors. July 2001. Archived from the original on 2011-10-15. Retrieved 2011-07-10. ^ a b c "Battery-electric Mitsubishi i EPA-rated at 112 MPGe combined, 62 mile "real-world" range; solar-powered CHAdeMO-compliant charging station". Green Car Congress. 2011-07-08. Retrieved 2011-07-10. ^ a b c "Mitsubishi's 'i' electric car gets better EPA rating than Volt, Leaf". USA Today. 2011-07-07. Retrieved 2011-07-10. ^ Nikki Gordon-Bloomfield (2011-07-07). "2012 Mitsubishi i Gets Official Ratings From EPA, Gets 112 MPGe". AllCarsElectric. Retrieved 2011-07-10. ^ "The Battery Pack for Mitsubishi's i MiEV". Green Car Congress. 2008-05-14. ^ "Mitsubishi selects Toshiba SCiB battery to power i-MiEV, Minicab MiEV". AutoblogGreen. 2011-06-21. Retrieved 2011-06-22. ^ a b c "Mitsubishi unveils Y4.59 mil electric car". Associated Press via Japan Today. 2009-06-06. Retrieved 2010-04-24. ^ "Electric car's battery to power home appliances". Yomiuri Shimbun. 2011-05-31. Retrieved 2011-06-06. ^ Nikki Gordon-Bloomfield (2011-06-01). "Mitsubishi Turns 2012 'i' into Portable Emergency Power Station". AllCarsElectric. Retrieved 2012-06-06. ^ "News & Products / Mitsubishi Monitor 2014 April & May". www.mitsubishi.com. ^ Brad Berman (2010-03-09). "Mitsubishi i-MiEV Review & Outlook". PluginCars.com. Retrieved 2010-10-06. ^ a b "Mitsubishi Motors offering i-MiEV in two trim levels: more affordable and more capable". Green Car Congress. 2011-07-06. Retrieved 2011-07-06. ^ "Green Vehicle Guide". Australian Government. Archived from the original on 2012-08-01. Retrieved 26 June 2011. ^ "Mitsubishi i-MiEV". Euro NCAP. Retrieved 2011-10-26. ^ "Citroen C-Zero". Euro NCAP. Retrieved 2011-03-15. ^ Beissmann, Tim (2010-12-17). "Mitsubishi i-MiEV four-star ANCAP safety rating". Car Advice. Retrieved 2010-12-17. ^ "2012 Mitsubishi i-Miev". National Highway Traffic Safety Administration. Retrieved 2012-09-12. ^ a b Hiroko Tabuchi (2013-03-27). "New Problem for Boeing 787 Battery Maker". The New York Times. Retrieved 2013-04-13. ^ Mitsubishi Motors Press Release (2013-04-27). "Mitsubishi reports fire in i-MiEV battery pack, melting in Outlander PHEV pack". Green Car Congress. Retrieved 2013-04-13. ^ Eric Loveday (2013-04-10). "Mitsubishi Extends Production Halt on Outlander PHEV as Perplexing Battery Investigation Continues". InsideEVs.com. Retrieved 2013-04-13. ^ a b "Mitsubishi Motors to triple electric car output". Associated Press via Japan Today. 2010-03-29. Retrieved 2010-04-25. ^ "Mitsubishi forms JV with GS Yuasa to build lithium ion batteries". AutoblogGreen. 2007-05-08. Retrieved 2011-01-17. ^ "Corporate Message". Lithium Energy Japan. Retrieved 2010-12-08. ^ "Press Release". Mitsubishi Motors. 2007-05-07. Retrieved 2010-12-08. ^ a b c "Mitsubishi Motors has produced 5,000 i-MiEVs to date". Green Car Congress. 2010-11-24. Retrieved 2010-11-27. ^ Eric Loveday (2010-11-29). "Mitsubishi i-MiEV production hits 5,000". AutoblogGreen. Retrieved 2011-01-12. ^ Nikkei (2011-05-26). "Mitsubishi Motors pitching i-MiEV to Europe's public sector". Green Car Congress. Retrieved 2011-05-26. ^ Danny King (2011-10-02). "Mitsubishi Starts Production Of U.S.-Bound EV". Edmunds Auto Observer. Retrieved 2011-11-04. ^ a b Daily Express (Sabah) (2013-03-22). "Mitsubishi Motors aims to sell more than 50 units of new electric vehicle". Daily Express. Retrieved 2013-03-26. ^ Karla Sanchez (2012-08-08). "On Hold: Mitsubishi Temporarily Stops Making i-MiEV for Peugeot-Citroen". Motor Trend. Retrieved 2012-10-17. ^ Barbara Leblanc (2012-08-07). "Le pôle véhicules électriques de PSA mis à mal par Mitsubishi?" [PSA leading electric vehicles challenged by Mitsubishi?] (in French). L'Usine Nouvelle. Retrieved 2012-08-07. ^ Nikkei Weekly (2012-08-06). "Nikkei: Isuzu, Mitsubishi Motors and Mazda weakening ties with Europe". Green Car Congress. Retrieved 2012-08-07. ^ a b c Faye Sunderland (2014-05-30). "Peugeot Citroen to reconsider electric car partnership with Mitsubishi". The Green Car Website UK. Retrieved 2014-09-06. A total of 651 Citroen C-Zeros and 455 Peugeot Ions were sold in Europe in 2013. ^ a b c "Mitsubishi Annual Report 2012" (PDF). Car manufacturer. Mitsubishi. Retrieved 2013-04-11. ^ a b "PSA Annual Report 2010". Car manufacturers. PSA. Retrieved 2013-04-11. ^ a b c "PSA Annual Report 2013". Car manufacturers. PSA. Retrieved 11 April 2013. ^ Guinness World Records (2012). "Best-selling electric car". Guinness World Records. Retrieved 2013-01-22. ^ Antony Ingram (2013-01-24). "Mitsubishi i-MiEV Electric Cars Recalled To Fix Braking Problem". Green Car Reports. Retrieved 2013-02-09. ^ Cobb, Jeff (2016-08-10). "Global 10 Best-Selling Plug-In Cars Are Accelerating Forward". HybridCars.com. Retrieved 2016-08-24. As of June 2016[update], cumulative global sales of the top selling plug-in electric cars were led by the Nissan Leaf (over 228,000), followed by theTesla Model S (129,393), Votl/Ampera family (about 117,300), Mitsubishi Outlander PHEV (about 107,400), Toyota Prius PHV (over 75,400), BYD Qin (56,191), Renault Zoe (51,193), BMW i3 (around 49,500), Mitsubishi i-MiEV family (about 37,600) and BYD Tang (37,509). ^ a b c Mark Kane (2014-01-14). "Sales Of Mitsubishi MiEV in Japan Fell Off Sharply in 2013; Battery Production Constraints Probable Cause". InsideEVs.com. Retrieved 2014-02-14. A total of 9,402 i MiEVs were sold in Japan between July 2009 and December 2013. ^ a b Mat Gasnier (2013-02-10). "Europe Full Year 2012: Now with Top 350 models & Top 60 brands". Best Selling Cars Blog. Retrieved 2013-02-13. ^ a b Mat Gasnier (2014-08-05). "Europe June 2014: Discover the Top 340 models and Top 55 brands". Best Selling Cars Blog. Retrieved 2014-08-13. ^ a b Ole Henrik Hannisdahl (2012-01-09). "Eventyrlig elbilsalg i 2011" [Adventurous electric vehicle sales in 2011] (in Norwegian). Grønn bil. Archived from the original on 2012-02-07. Retrieved 2012-01-14. See table "Elbilsalg i 2011 fordelt på måned og merke" (Electric vehicle sales in 2011, by month and brand) to see monthly sales for 2011. ^ a b c "Salgstall pr. des 2012" [Sales Figures December 2012] (in Norwegian). Grønn bil. January 2013. Archived from the original on 2012-04-26. Retrieved 2013-01-22. See graph "Salgstall pr. des 2012" (Sales Figures December 2012) for details of monthly sales for 2012. ^ a b Ståle Frydenlund (2014-07-18). "Snart 10.000 nye elbiler registrert" [Almost 10,000 new EVs registered] (in Norwegian). Norsk Elbilforening (Norwegian Electric Vehicle Association). Archived from the original on 2014-08-11. Retrieved 2014-09-06. ^ a b "Elbil-salget tok ikke sommerferie i juli" [EV sales did not take summer vacation in July] (in Norwegian). Grønn bil. 2014-08-04. Retrieved 2014-09-06. ^ a b Automobile Propre. "Chiffres de vente & immatriculations de voitures électriques en France" [Sales figures & electric car registrations in France] (in French). Automobile Propre. Retrieved 2014-09-06. See "Ventes de voitures électriques en 2014, 2013, 2012, 2011 and 2010" It shows all electric car registrations between 2010 and 2014. ^ a b Autobild (2012-01-12). "2011 Full Year Best-Selling Electric Cars in Germany in 2011". European Traveler. Retrieved 2012-02-07. ^ a b Kraftfahrt-Bundesamtes (KBA) (January 2013). "Neuzulassungen von Personenkraftwagen im Dezember 2012 nach Marken und Modellreihen" [New registrations of passenger cars in December 2012 by make and model series] (PDF) (in German). KBA. Retrieved 2013-01-22. ^ a b Kraftfahrt-Bundesamtes (KBA) (January 2014). "Neuzulassungen von Personenkraftwagen im Dezember 2013 nach Segmenten und Modellreihen" [New registrations of passenger cars in December 2013 by segment and model series] (PDF) (in German). KBA. Retrieved 2014-02-14. ^ Kraftfahrt-Bundesamtes (KBA) (August 2014). "Neuzulassungen von Personenkraftwagen im Juli 2014 nach Segmenten und Modellreihen im Juli 2014" [New registrations of passenger cars in July 2014 by segment and model] (PDF) (in German). KBA. Retrieved 2014-09-06. ^ a b c d e "Mitsubishi i MiEV Sales Figures". Good Car Bad Car. January 2015. Retrieved 2015-03-28. Table shows monthly and yearly Canadian and U.S. sales figures. ^ "Mitsubishi i-MiEV headed to Australia: becomes country's first manufacturer-produced EV". AutoblogGreen. 2010-06-09. Retrieved 2010-06-19. ^ a b Tim Beissmann (2011-03-19). "2011 Mitsubishi i-MiEV on sale to Australian public in Q3". Car Advice. Retrieved 2011-05-21. ^ "Mitsubishi Motors to Begin Shipping i-MiEV to Australia in July; 2nd Market Outside Japan". Green Car Congress. 2010-06-02. Retrieved 2010-06-02. ^ a b "Mitsubishi first to launch EV in Australia". Go Auto. 2010-06-10. Retrieved 2010-06-20. ^ "Demand for i-MiEV in Australia Three Times Greater Than Limited Supply". Green Car Congress. 2010-07-15. Retrieved 2010-07-15. ^ a b c Gasnier, Mat. "Australia Full Year 2010: Commodore #1 for 15th year in a row". Best Selling Cars. Retrieved 12 December 2012. ^ a b Eric Loveday (2011-07-04). "Mitsubishi lops $15,000 off price of 2012 i-MiEV in Australia". AutoblogGreen. Retrieved 2011-07-04. ^ Fallah, Alborz. "Mitsubishi i-MiEV on sale for around $50,000 from August". CarAdvice. Retrieved 10 June 2011. ^ a b Mat Gasnier (2013-01-05). "Australia Full Year 2012: Mazda3 leads again in record market, no local model on podium for the first time since 1930s!". Best Selling Car Blog. Retrieved 2013-01-19. ^ a b Jose Pontes (2014-01-18). "Australia December 2013". EVSales.com. Retrieved 2014-02-15. ^ a b Joshua Dowling (2014-04-10). "BMW launches electric car in Australia, wants taxpayers to foot $10,000 of its $64,000 price". News.com.au. Retrieved 2014-04-12. ^ Louis Butcher (2010-01-14). "Hydro-Québec s'associe à Mitsubishi pour tester une cinquantaine de véhicules électriques" [Hydro-Quebec joins Mitsubishi to test fifty electric vehicles] (in French). Rue Frontenac. Retrieved 2010-05-30. ^ "All systems go! Hydro-Québec and Mitsubishi launch the largest electric vehicle trial in Canada". Canadian News Wire. 2010-12-20. Retrieved 2010-02-06. ^ "Government of Canada and Mitsubishi Motor Sales of Canada partner to conduct all-electric vehicle trials". Transport Canada. 2010-10-20. Archived from the original on 2010-10-24. Retrieved 2011-01-12. ^ Michael Bettencourt (2011-10-17). "Cheapest fully electric vehicle coming to Canada soon". The Globe and Mail. Retrieved 2011-10-24. ^ a b c Sebastian Blanco (2011-06-08). "Mitsubishi sets Canadian i-MiEV price at $32,998". AutoblogGreen. Retrieved 2011-06-08. ^ "Mitsubishi plans 2011 EV launch in Canada". Wheels.ca. 2010-11-12. Retrieved 2010-02-06. ^ Williams, Evan. "Mitsubishi Dropping i-Miev for 2018". Autotrader. Autotrader.ca. Retrieved 15 July 2018. ^ a b Mitsubishi Motors (2010-08-31). "Mitsubishi Motors to Premiere the European-spec i-MiEV at the 2010 Paris Motor Show". Green Car Congress. Retrieved 2010-09-01. ^ a b "Mitsubishi Motors Begins Production of European-Spec i-MiEV and PSA Variants; Targeting 5,000 Units Sold Overseas in FY2010". Green Car Congress. 2010-10-06. Retrieved 2010-10-06. ^ "The i-MiEV goes on sale in 15 European countries; near-term plan to boost that to 19". GreenCarCongress. 2011-01-14. ^ a b "Mitsubishi begins delivery of the largest order of i-MiEVs to date; 50 of 507 to Estonian government". Green Car Congress. 2011-10-24. Retrieved 2011-10-26. ^ Justin Aschard (2012-11-30). "Inmatriculations VP et VUL Autriche à fin Oct. 2012 (2010-2012)" [Registrations of passenger cars and utility vehicles in Austria through October 2012 (2010-2012)] (PDF) (in French). France Mobilité Électrique. Retrieved 2012-12-15. ^ Jose Pontes (2013-01-19). "Austria Full Year 2012". EV Sales. Retrieved 2013-07-20. ^ KFZ- Wirtschaftsverlag (2014-01-01). "Aktuelle Zulassungsstatistik" [current registration statistics] (in German). Automotive.co.at. Retrieved 2014-02-15. See data for "Jän - Dez 2013" and "Jän - Dez 2012"
^ De Danske Bilimportører (January 2013). "Statistik - Personbiler: 2011- Hele Hele året/januar-december 2012" [Statistics - Passenger cars: 2011- All year/January–December 2012] (in Danish). Bilimp. Archived from the original on 2013-05-08. Retrieved 2013-01-22. Select year and click on Pr. model for details of sales by brand and model. ^ De Danske Bilimportører (January 2014). "Statistik - Personbiler: 2013- Hele Hele året/januar-september 2013" [Statistics - Passenger cars: 2013- January–September 2013] (in Danish). Bilimp. Archived from the original on 2013-05-08. Retrieved 2014-02-15. Select year and click on Pr. model for details of sales by brand and model. ^ Tammik, Ott (March 3, 2011). "State Buys 507 Electric Cars, Builds Charging Network". ERR. ^ "Estonia will promote the use of electric cars under a Green Investment Scheme". Estonian government. March 3, 2011. ^ Ingrid Teesalu (2011-10-14). "One in Four Electric Cars Still Unclaimed". Estonian Public Broadcasting News. Retrieved 2011-10-27. ^ Ingrid Teesalu (2011-08-16). "Municipalities Skeptical About Acquiring Electric Cars". Estonian Public Broadcasting News. Retrieved 2011-10-27. ^ Ingrid Teesalu (2011-09-05). "Municipalities Show Lukewarm Interest in Electric Cars". Estonian Public Broadcasting News. Retrieved 2011-10-27. ^ Laurent Meillaud (2012-01-14). "2630 voitures électriques immatriculées en 2011" [2630 electric cars registered in 2011] (in French). MSN France. Retrieved 2012-01-15. ^ Loveday, Eric (2011-10-07). "Renault to sell 15,600 electric vehicles to French government". Autoblog Green. Retrieved 2011-10-12. ^ "Citroën includes C-ZERO EV in MultiCity rental service". Green Car Congress. 2011-06-07. Retrieved 2011-06-07. ^ a b "DATEN: Mitsubishi i-MiEV - sinnvolle Innovationen für eine saubere Welt" (in German). Mitsubishi Motors Website. 2011-04-24. Archived from the original on 2011-01-17. Retrieved 2011-04-24. ^ John Blau (2010-05-03). "Berlin plugs in electric mobility strategy". Deutsche Welle. Retrieved 2010-05-26. ^ "Overview of Tax Incentives for Electric Vehicles in the EU" (PDF). European Automobile Manufacturers Association. 2010-04-20. Archived from the original (PDF) on 2011-06-11. Retrieved 2011-12-06. ^ Kraftfahrt-Bundesamtes (KBA) (January 2015). "Neuzulassungen von Personenkraftwagen nach Segmenten und Modellreihen im Dezember 2014" [New registrations of passenger cars in December 2014 by segment and model] (PDF) (in German). KBA. Retrieved 2015-03-28. A total of 187 units were registered in Germany in 2014. ^ Luca Moroni (2013-01-03). "I dati di vendita di auto elettriche e ibride a dicembre 2012 in Italia" [Sales figures of electric and hybrid cars in Italy through December 2012] (in Italian). Green Start. Archived from the original on 2013-01-05. Retrieved 2014-02-15. ^ Luca Moroni (2014-01-03). "I dati di vendita di auto elettriche e ibride a dicembre 2013 in Italia" [Sales figures of electric and hybrid cars in Italy through December 2013] (in Italian). Green Start. Archived from the original on 2014-01-07. Retrieved 2014-02-15. ^ Mitchel van Essen (2019-01-18). "Verkoop Mitsubishi i-MiEV ten einde" [Sales Mitsubishi i-MiEV ending] (in Dutch). AutoWeek. Retrieved 2019-01-19. ^ a b Ole Henrik Hannisdahl (2012-01-09). "Eventyrlig elbilsalg i 2011" [Adventurous electric vehicle sales in 2011] (in Norwegian). Grønn bil. Archived from the original on 2012-02-07. Retrieved 2012-01-14. See table "Elbilsalg i 2011 fordelt på måned og merke" (Electric vehicle sales in 2011, by month and brand). ^ Rune Haaland (2011-05-10). "i-MIEV nr 500 levert til kunde" (in Norwegian). Norsk elbilforening. Retrieved 2011-05-21. ^ Per Erlien Dalløkke (2011-12-01). "Rekordsalg av elbiler (Record Sales of electric cars)" (in Norwegian). Tu.no. Retrieved 2011-12-05. ^ Norwegian Road Federation (OFV). "Statistikk-Salgstall pr. nov 2011" (in Norwegian). Gronnbil. Archived from the original on 2012-04-26. Retrieved 2011-12-05. Click on the bar graph for sales details by brand by month. ^ Staff (2014-01-08). "Over 20.000 ladbare biler på norske veier" [Over 20,000 rechargeable electric cars on Norwegian road] (in Norwegian). Grønn bil. Archived from the original on 2014-01-23. Retrieved 2014-02-14. ^ Norwegian Road Federation (OFV) (January 2015). "CO2-utslippet i desember 2014" [CO2 emissions in December 2014] (in Norwegian). OFV. Retrieved 2015-02-14. See graph: Gjennomsnittlig CO2-utslipp for registrerte ney personbiler per modell 2014, til og med desember. ^ a b "El Mitsubishi i-MiEV ya se vende en España" (in Spanish). MSN Español. 2011-01-14. Retrieved 2011-01-17. ^ "Mitsubishi i-MiEV" (in Spanish). km77.com. 2011-01-04. Retrieved 2011-01-17. ^ a b "Ventas en España de coches híbridos y eléctricos en 2011" [Hybrid and electric car sales in Spain in 2011] (in Spanish). Motor Pasión Futuro. 2012-01-06. Retrieved 2012-05-13. A total of 401 electric cars and utility vehicles were sold in Spain during 2011. ^ Asociación Nacional de Importadores de Automóviles, Camiones, Autobuses y Motocicletas (ANIACAM) (January 2013). "Datos de Mercado: Diciembre 2012 - Matriculaciones de automóviles" [Market data: December 2012 - Automobiles registrations] (in Spanish). ANIACAM. Retrieved 2013-01-19. CS1 maint: Multiple names: authors list (link)Download the file DossierAutomóviles_diciembre12.xls with current month and cumulative sales for 2012. ^ Asociación Nacional de Importadores de Automóviles, Camiones, Autobuses y Motocicletas (ANIACAM) (January 2014). "Datos de Mercado: Diciembre 2013 - Matriculaciones de automóviles" [Market data: December 2013 - Automobiles registrations] (in Spanish). ANIACAM. Retrieved 2014-02-15. CS1 maint: Multiple names: authors list (link) Download the file "DossierAutomóviles_diciembre13.xls (929KB)" with current month and cumulative sales for 2013. ^ "2012 (Full Year) Sweden: Best-Selling Electric Cars & Plug-In Hybrid Models". BestSellingCars.com. 2013-01-02. Retrieved 2013-01-22. ^ Bil Sweden (2014-01-02). "Nyregistreringar december 2013 prel" [New registrations in December 2013 prel] (in Swedish). Bil Sweden. Retrieved 2014-02-15. Download file "Nyregistreringar december 2013 prel.pdf" see table "NYREGISTRERADE SUPERMILJÖBILAR DECEMBER 2013" with summary of PEV sales by model for 2013 and 2012. ^ Vereinigung Scheweizer Automobil-Importeure. "Autoverkäufe nach Modellen" [Passenger cars by model - Statistic by model cars in 2013] (in German). Auto Schweiz Suisse. Retrieved 2014-02-09. Under "Modellstatistik" download the xls file for "Januar–Dezember 2013" cumulative sales are presented in tabs by month: Dez (2013). Click the tabs "2012 Statistik" and "2011 Statistik" to download the files with 2012 and 2011 sales by model. ^ a b "First phase results of UK electric vehicle trial complete, average of 23 miles a day". AutoblogGreen. 2010-06-16. Retrieved 2010-06-19. ^ a b Tim Pollard (2010-03-24). "Mitsubishi i-MiEV (2011) electric car to cost £39,000". CAR magazine. Retrieved 2010-03-24. ^ "Mitsubishi lands iMiev with £38,000 price tag". Reuters. 2010-03-23. ^ a b "Mitsubishi i-Miev price drops by £10k". What Car?. 2010-08-19. Retrieved 2010-08-22. ^ Adam Vaughan (2011-01-01). "UK government launches £5,000 electric car grant scheme". The Guardian. Retrieved 2011-01-12. ^ a b "Mitsubishi announces EV sales centre locations". IBTimes UK. 2011-01-11. Retrieved 2011-01-12. ^ Eric Loveday (2011-04-20). "Hertz offering Mitsubishi i-MiEV rentals in UK". AutoblogGreen. Retrieved 2011-05-22. ^ Justin Aschard (2012-11-30). "Inmatriculations VP et VUL Royaume-Uni à fin Oct. (2010-2012) 2012" [Registrations of passenger cars and utility vehicles in the United Kingdom through October 2012 (2010-2012)] (PDF) (in French). France Mobilité Électrique. Retrieved 2012-12-15. ^ Mat Gasnier (2013-02-01). "UK Full Year 2012: Now with Top 350 All-models ranking!". Best Selling Cars Blog. Retrieved 2013-02-07. ^ Jose Pontes (2013-10-09). "UK June 2013". EV Sales. Retrieved 2014-02-15. ^ "I-MIEV discontinued in UK". Retrieved 2016-07-08. ^ "Mitsubishi Motors Begins Production of i-MiEV; Targeting 1,400 Units in Fiscal 2009". Green Car Congress. 2009-06-05. Retrieved 2010-04-04. ^ John Murphy (2009-06-08). "Mitsubishi Launches Electric Car". Wall Street Journal. Retrieved 2010-04-24. ^ "Fact Sheet - Japanese Government Incentives for the Purchase of Environmentally Friendly Vehicles" (PDF). Japan Automobile Manufacturers Association. Archived from the original (PDF) on 2010-12-26. Retrieved 2010-11-13. ^ "Mitsubishi to cut price of electric cars -Nikkei". Reuters. 2010-06-17. Retrieved 2010-06-23. ^ "三菱 i-MiEVなどの2014年12月度 生産・販売実績" [Mitsubishi i-MiEV sales results for December 2014] (in Japanese). Electric Vehicle News. 2015-01-28. Retrieved 2015-03-21. ^ "Mitsubishi i-MiEV lineup expands for 2012 with cheaper "M" and extended-range "G"". AutoblogGreen. 2011-07-06. Retrieved 2011-07-06. ^ a b Sebastian Blanco (2011-09-09). "Mitsubishi raises price of all-electric i by an "unforeseen" $1,135". Autoblog Green. Retrieved 2011-09-11. ^ a b Tori Tellem (2010-11-18). "2011 Mitsubishi i-MiEV Is Coming to North America". New York Times. Retrieved 2010-11-18. ^ Nick Chambers (2010-11-22). "Mitsubishi Shows Off Americanized "i" Electric Car, Drops "-MiEV" From Name". PluginCars.com. Retrieved 2010-11-27. ^ Wayne Cunningham (2010-11-18). "Mitsubishi shows its i electric car in Los Angeles". CNET.com. Retrieved 2010-11-27. ^ Jake Holmes. "2012 Mitsubishi i-MiEV U.S.-Spec Photos and Info - Auto Shows". Car and Driver (Nov 2010 issue). Retrieved 2011-04-23. ^ a b Tiffany Hsu (2010-11-17). "L.A. Auto Show: Mitsubishi reveals 'i' electric vehicle for North America". Los Angeles Times. Retrieved 2010-11-18. ^ Richard S. Chang (2010-11-09). "Mitsubishi Reveals U.S. i-MiEV Ahead of L.A. Auto Show". New York Times. Retrieved 2010-11-13. ^ Ryan Beene (2010-09-06). "Mitsubishi will upgrade i-MiEV for U.S." Automotive News. Retrieved 2010-09-09. ^ "i customization email from mitsubishi". My i MiEV Forum. Retrieved 2011-09-03. ^ Sebastian Blanco (2011-12-05). "Mitsubishi i sales plan moved up in U.S., Mirage EV coming in 2013". Autoblog Green. Retrieved 2011-12-06. ^ John Voelcker (2011-12-09). "First Production 2012 Mitsubishi 'i' Delivered in San Francisco". Green Car Reports. Retrieved 2011-12-10. ^ "2014 Mitsubishi i MiEV electric car gets massive price cut ($6,130)". ^ Tsui, Chris. "The Mitsubishi i-MiEV Is Discontinued In America". ^ a b "Mitsubishi Begins Sales of i-MiEV to Individuals in Hong Kong; First Individual Sales Outside of Japan". Green Car Congress. 2010-05-20. Retrieved 2010-05-21. ^ a b "Mitsubishi To Launch Its Electric Car First in Costa Rica". InsideCostaRica. 2010-12-27. Retrieved 2011-01-12. ^ a b Alejandro Marimán Ibarra (2011-05-04). "Mitsubishi i-MIEV: Lanzado oficialmente en Chile" (in Spanish). Yahoo Chile. Archived from the original on 2011-10-21. Retrieved 2011-07-21. ^ a b "Mitsubishi i-MiEV in Russia will cost RUB1,799,000" (in Russian). Retrieved 2011-06-09. ^ a b "Mitsubishi First To Launch Electric Cars To Kiwis". Voxy.com.nz. 2011-03-29. Retrieved 2011-07-21. ^ Roberto Valencia (2011-03-17). "Desde julio se venderá en Chile el primer auto 100% eléctrico". La Nación (Chile) (in Spanish). Archived from the original on 2012-04-06. Retrieved 2011-04-28. ^ "Chile inaugura primera estación de carga para autos eléctricos en Latinoamérica". Caribbean News Digital (in Spanish). 2011-04-21. Retrieved 2011-04-28. ^ "Autos eléctricos en Latinoamérica" [Electric cars in Latin America] (in Spanish). Publinews. 2012-08-10. Retrieved 2012-08-29. ^ "Carro 100% eléctrico i-miev ya recorre las calles del país". La Nación (San José) (in Spanish). Rebeca Madrigal. 2011-02-26. Archived from the original on 2011-03-01. Retrieved 2011-02-26. ^ "i-MiEV Goes on Sale in Costa Rica". Green Car Congress. 2011-02-28. Retrieved 2011-03-02. ^ "Mitsubishi lanza auto eléctrico en Costa Rica". La Nación (San José) (in Spanish). ACAN-EFE. 2010-12-14. Archived from the original on 2010-12-19. Retrieved 2011-01-12. ^ "Mitsubishi's i-MiEV to hit Costa Rica". Motoren. 2011-03-03. Retrieved 2011-05-21. ^ "Sales of Mitsubishi Motors' i-MiEV New-generation Electric Vehicle to Individuals Begins in Hong Kong". Mitsubishi Motors Press Release. 2010-05-20. Retrieved 2010-11-13. ^ "Mitsubishi i-MIEV vehicles to provide assistance to commuters on Penang Second Bridge - Latest - New Straits Times". New Straits Times. 2014-01-15. Retrieved 2014-05-15. ^ "i-MieV price drops by 800 000 rubles" (in Russian). Drom.ru. ^ "Mitsubishi Inks Deal with Singapore Government". Motoren. 2010-11-20. Retrieved 2011-05-21. ^ a b "Singapore: Electric vehicle tests to start in mid-2011". Business Times (Singapore). Eco-Business.com. 2011-02-19. Retrieved 2011-05-21. ^ "Mitsubishi Tests the i-MiEV in Thailand". AutoEvolution. 2010-12-13. Retrieved 2011-07-21. ^ Eric Loveday (2011-07-18). "Mitsubishi to test electric i-MiEV in Thailand". AutoblogGreen. Retrieved 2011-07-21. ^ Mitsubishi Heavy Industries (2011-01-27). "Masdar Launches Electric-Vehicle Pilot". Mitsubishi Heavy Industries. Archived from the original on 2011-08-07. Retrieved 2012-07-14. ^ Abu Dhabi Future Energy Company (Masdar) (2011). "Masdar City - Sustainability and the City:Transportation". Masdar. Archived from the original on 2013-08-28. Retrieved 2012-07-14. ^ "三菱 i-MiEVなどの2014年6月度、2014年1～6月 生産・販売・輸出実績" [June 2014 Mitsubishi Motors, production, sales and export results January–June 2014] (in Japanese). Electric Vehicle News. 2014-07-30. Retrieved 2014-09-06. A total of 507 i-MiEVs were sold in Japan during the first half of 2014. ^ "Mitsubishi iMiEV wins Japan Automotive Hall of Fame's "Car Technology of the Year" Award". AutoblogGreen. 2009-10-30. Retrieved 2010-06-19. ^ "i MiEV wins 'Most Advanced Technology' award in Toyko". Thegreencarwebsite.co.uk. 2009-10-23. Retrieved 2010-11-27. ^ "Mitsubishi Motors' i-MiEV voted "Ecobest 2009" by the AUTOBEST jury". Mitsubishi Motors Australia. 2010-02-12. Archived from the original on March 13, 2011. Retrieved 2010-12-12. ^ "Mitsubishi Motors' i-MiEV Awarded with the "Environment Special Grand Prize" at the 25th International Automobile Festival". Mitsubishi Motors Press Release. 2010-02-08. Retrieved 2011-01-12. ^ "Green Car's Top 5 Vehicles that Envision The Road Ahead". Green Car Journal. 2011-01-05. Archived from the original on 2011-01-21. Retrieved 2011-01-18. ^ Chris Woodyard (2011-10-24). "Diesel, electric, natural gas vie for Green Car honors". USA Today. Retrieved 2011-10-24. ^ American Council for an Energy-Efficient Economy. "Greenest Vehicles of 2012". GreenCars.org. Archived from the original on 2007-09-10. Retrieved 2012-02-08. Wikimedia Commons has media related to Mitsubishi i-MiEV.